1. Set of Four Biscuit Snack Boxes £6.50 (was £10.00) [x] : If you're British you'll probably get that we have a ridiculous love for our biscuits, especially the ones that make us feel all nostalgic so I love these cute snack boxes. 2. Amelia Lilac Cosmetic Bag £10.00 [x] : If you follow me on Instagram you will have seen me absolutely lusting over Oliver Bonas's new makeup bag collection. This cute little lilac one is just so pretty, that I'm desperately having to resist the temptation to buy it. 3. Hello Sunshine Trinket Dish £5.00 [x] : As an owner of three trinket trays (whoops!) I'll admit that I don't really use them for anything, except of course to make my room look prettier. That said I'm in love with this adorable one from Sass&Belle, it adds that extra bit of positivity that we all need in our lives. 4. Marilyn Mermaid Jewellery Dish £7.50 [x] : Top tip if you're looking for a super cute jewellery dish head over to Sass and Belle now! They have so many cute ones including one with a fawn, bear, rabbit and even unicorn but this mermaid one has definitely captured my heart. 5. Rustic Pig Planter £7.50 [x] : If you're looking to grow your plant collection but want to add a stylish twist then pick up one of these cute little pig planters. It's making me want to create a little plant collection of my own. 6. Set of 4 Kitty Cat Measuring Cups £19.00 [x] : If you don't want this set of cute cat measuring cups then I am definitely judging. These just make me want to bake. Thanks for reading lovelies! Have a great week. very cute picks! love the pig planter! Awww, those kitty cat measuring cups are lovely! 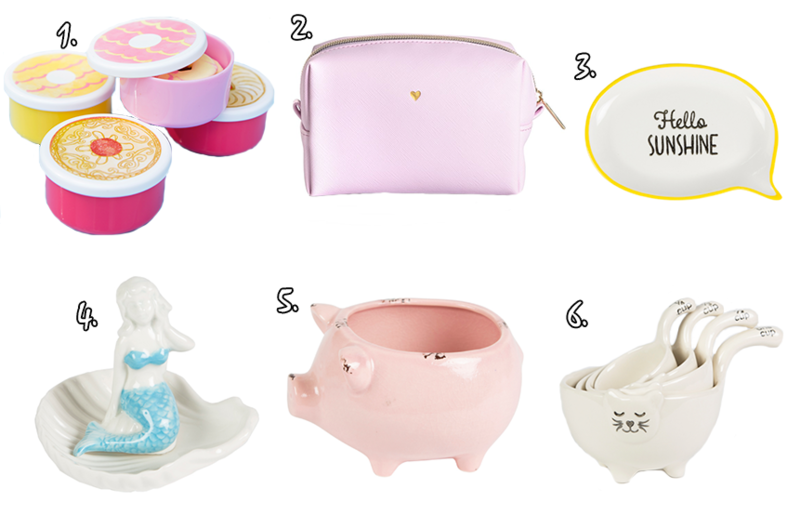 I also really like the Mermaid jewellery dish :) I'm definitely gonna check out the Sass & Belle website!